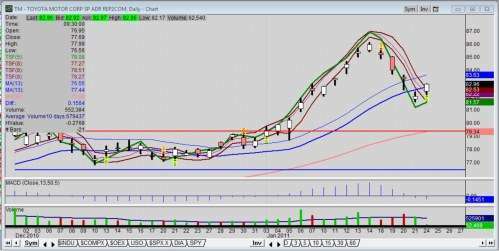 Toyota Motors (NYSE: TM) once again is showing strength the first hour of trading, gapping up from Friday’s close, the day of option expiration. Like most auto stocks last week, Toyota stock (NYSE: TM) succumbed to the bearish drive downward into Friday’s option expiration. However, it found buyers on Friday and confirmed the move with more on Monday, today's first hour of trading. On the fundamental side, Toyota’s recall issues had taken its toll on its position in the U.S. auto market, falling from second to third place, behind General Motors and Ford Motor Co., and the stock fell from its lofty price of 134.31 in 2006. Lately, though, the stock price hasn’t reflected any extreme downgrade by investors since the lows of summer 2010; and experienced only a slight sell-off into January‘s option expiration. Per the market’s response, this appears to be a buying opportunity. By 10 a.m. today, it reached a high of 83.02. From the technical chartist perspective, Toyota stock has been trading technically above its 50-day moving average since early November, but in a sideways channel until a breakout movement in late October drove it to its present heights and a recent high of 86.10. The latest sell-off, though, started last Tuesday from the previous Friday close of 85.96. However, the lower highs, lower closes and lower lows met some buying on Friday, the last day for January options. In fact, TM closed up for the day. Most market technicians, those who use technical analysis to divine the dynamics of price to assess the market, noticed as early as last Thursday, the day before option expiration, the bottoming tail with Thursday’s candle. Note again that long tail below the close and keep it in your arsenal of technical tools for future evaluation. It seems to have paid off this time. With Friday being the last day for January options, the bottoming tail proved to be a valid signal that buyers were setting up to come back in early, and not wait until today (Monday) to get long Toyota. Nobody can say for sure how long this move will last, but it makes sense to look at the price dynamics in terms of probabilities. Again, be apprised Toyota received positive press at 2011 NAIAS in Detroit these past two weeks.